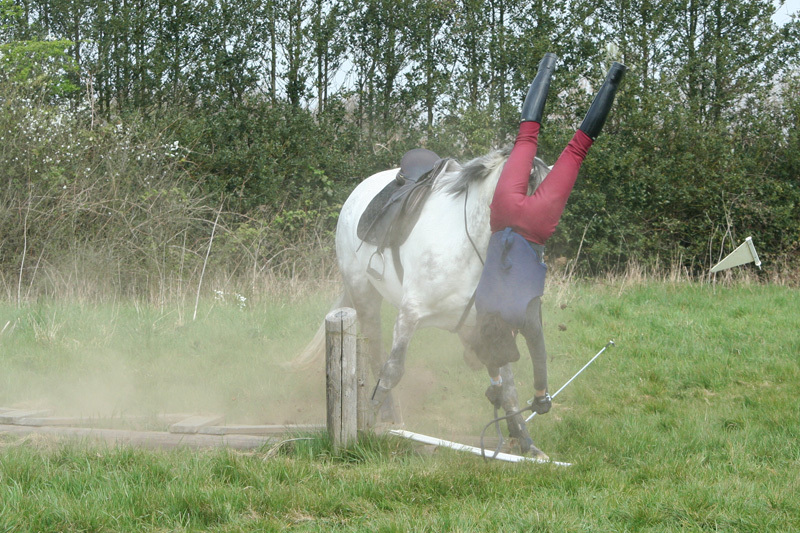 For most horse riders, the idea of taking a tumble is a constant presence at the back of our minds. Horses are big, powerful animals, and they can move fast. Fall from the back of a 16.2hh horse that’s galloping at 30 miles an hour, and you could really do yourself some damage. The surprising thing is that more of us don’t. In all my years of riding, I’ve never had a bad fall (touches wood frantically). I have a large circle of riding friends and acquaintances, all of whom fall off occasionally. I know several people that have cracked wrists or tweaked backs, but I only know two people who’ve had bad falls – a broken pelvis and a cracked vertebra respectively – and both had an above average amount of bad luck. Both riders recovered fully and went back to riding at their original level. I’ve been following the progress of Michelle Reid, the Times columnist who suffered a devastating riding accident which left her in a wheelchair. In her column, she’s charting the highs and lows of her rehab process, and recently wrote about her first emotional post-accident encounter with a horse, an article that was reproduced in the Nov/Dec 2011 issue of British Horse, the BHS magazine. Her accident happened when her horse refused a small jump during a training session – something that happens to most of us regularly – and again she had very bad luck to suffer such serious injuries. She writes of the feelings that visiting a friend’s horse has reawakened, and of her fear that she might never feel strong enough to face her own horse again. Michelle’s case is an extreme one, and the extent of her injuries mean that she’s facing challenges I can’t imagine. However, even if there’s no injury involved at all, it’s easy to lose confidence after a fall. Once you’ve lost faith in a particular horse or activity, it can be very difficult to get it back. It’s an issue that many of us end up having to face, and there are tried-and-tested methods of tackling it. Think about what happened and why. Could you avoid putting yourself in that particular situation again in the future? Can you work on the cause of the accident? If your horse spooked at a new hazard, like a tractor, find a friendly farmer and practice de-sensitising your horse. Take control of the situation, and you’ll reduce the chances of it happening again. Get your horse checked out. 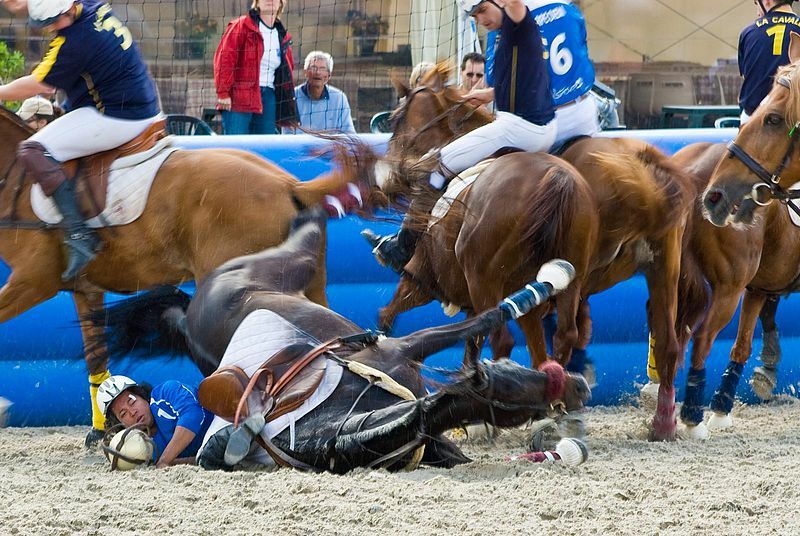 Many bouts of ‘bad behaviour’, such as unexplained, sudden bucking can be traced to physical pain. If your horse is behaving uncharacteristicly, he could have a bad back or sore mouth. Be prepared. Always wear a hat – this will reduce your chances of injury dramatically. Remember Oliver Townend’s spectacular fall in 2010? Amazingly, he suffered only minor injuries. Consider wearing a back protector as well, and do all the normal safety checks on your tack from time to time. Over the years of my partnership with Blue, I’ve learnt to recognise her ‘triggers’ – and now I avoid them. For example, she’s never liked tractors, but I know that if I can find a gateway or somewhere else where there’s a little space, she’ll be fine. All the local tractor drivers are used to us now, and are normally extremely patient. However, I wouldn’t take her hunting, or ride her in a procession, because I know she’d get too stressed. Ride a friend’s horse. Changing your own mount for a schoolmaster for a while can help to restore confidence when you get back on your own horse. Do something different. Sign up for a holiday with your horse or go on a long distance ride with friends. This will help strengthen the relationship with your horse, and remind you that riding’s meant to be fun. Get someone to help. If your fall was a result of a weak seat or postural problem, a good instructor can help you work on this. Send your horse away for reschooling. If your horse is exhibiting a certain type of behaviour that causes you to fall, such as spinning round or rearing, consider sending him to a professional. Get him checked by a vet first though, to make sure there’s no physical trigger. Attend a confidence workshop. The instructor will teach you a series of techniques to help you manage your nerves and overcome them – many people find this approach very beneficial. Learn how to fall. A high percentage of riding injuries involves damage to wrists, arms or shoulders, as the rider automatically flings an arm out to try and stop their fall. Watch some videos of jockeys falling off in races, and you’ll notice how they fold their arms into their bodies, tuck in their chins and try to fall onto the backs of their shoulders. Falling in this way will greatly lessen your chances of injury. Find a barrel or other low support, put it in the arena to give you a soft surface, and teach yourself to fall. Sell your horse. Riding is supposed to be an enjoyable hobby. If you’ve reached the stage where you’re constantly tense and nervous every moment you’re in the saddle, and the only time you smile is when it’s time to get off, then consider ending the partnership. Struggling on regardless does neither of you any favours, and it could be time to look at forming a new partnership with another horse.